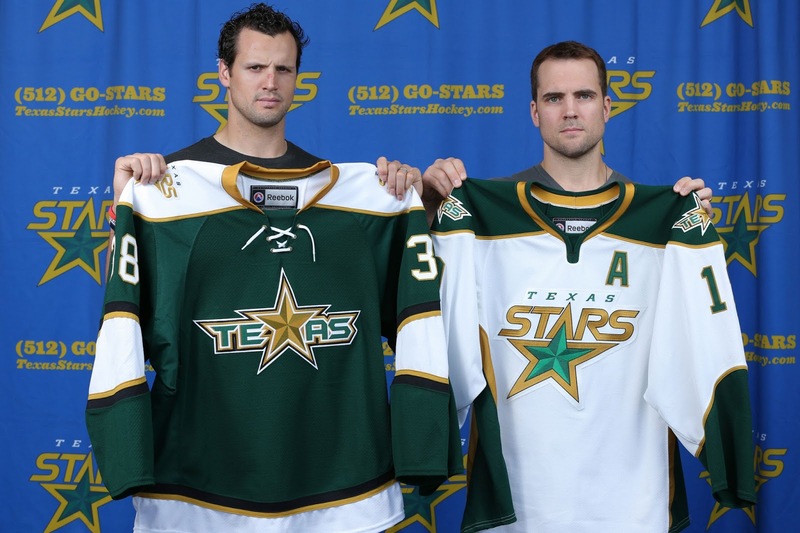 In conjunction with their fifth season in the AHL, the Texas Stars announced today their new look for the 2013-14 season including redesigned home and away jerseys. The most significant change is the road jersey. Texas will sport green as their base color and use the "TEXAS" logo which replaces the X with a star as the front crest. The jersey also incorporates a lace up collar. The home jersey will be the same as the 2011-13 alternate jersey. As previously mentioned, the team did not coordinate with the Dallas Stars on these changes. Dallas is expected to change both their jersey and logo this summer with the announcement planned for June 4th. More pictures and the full release below. Click on the pictures to expand them. 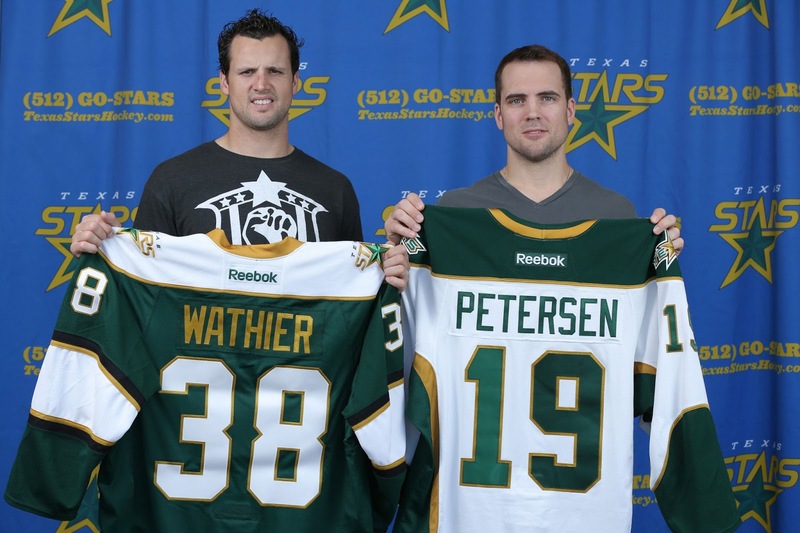 The Texas Stars introduced today their new jerseys for the 2013-14 season, which will be the team’s fifth anniversary season in the American Hockey League. 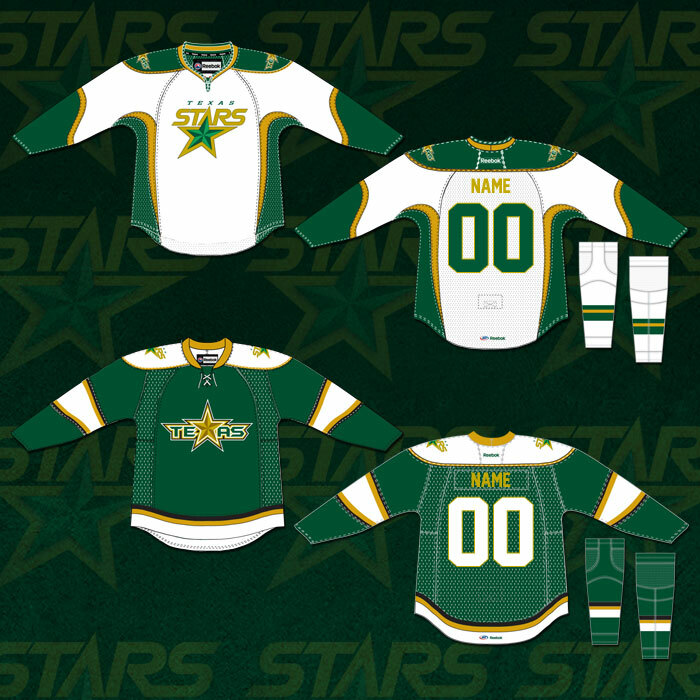 In preparation for the fifth season of AHL hockey in Cedar Park, the Stars will make a significant shift in their road jersey colors. Texas is replacing the all-black away uniform with a primarily dark green jersey, the same dark green that is featured in the team’s logo, and the crest patch will feature the team’s secondary logo. The shoulder cap is white with a primary logo patch on each side. The collar is gold and includes a white lace tie-up. 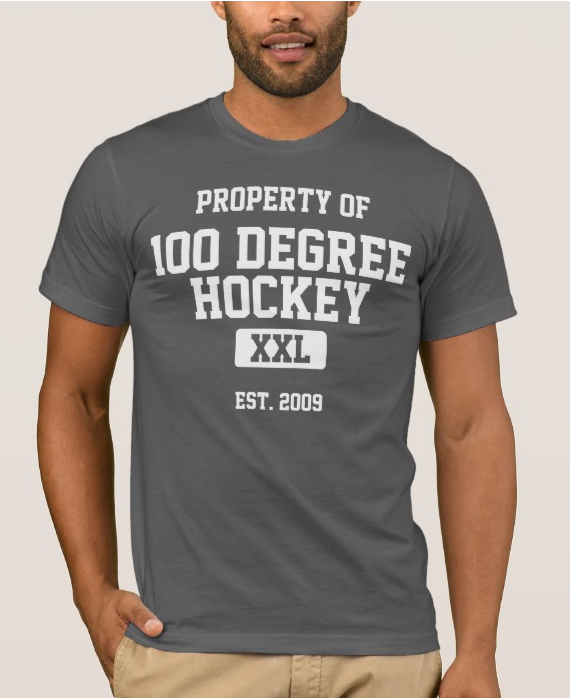 The sweater will also have thick white bands on each sleeve and along the bottom hem, trimmed with black and gold. The matching socks will be principally dark green with three bands of black, gold and white just below the knee. Texas’ new home jersey is a jersey that was unveiled initially as the team’s alternate jersey prior to the 2011-12 season. 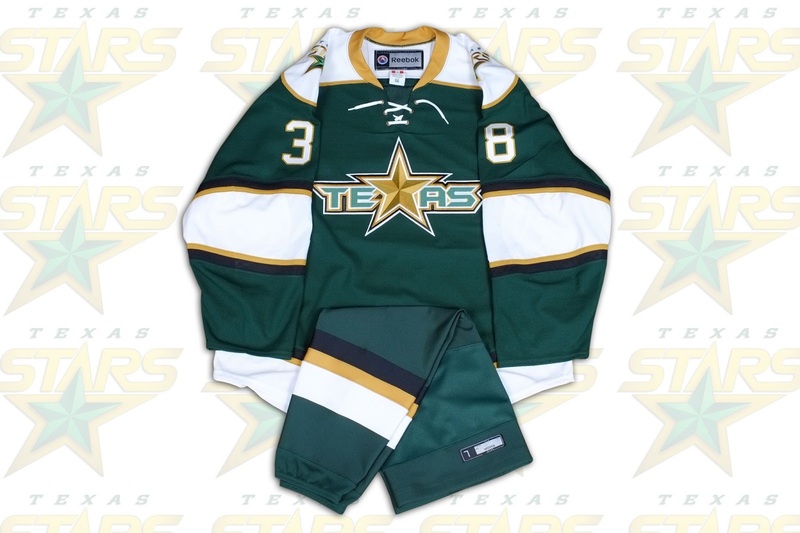 The jersey is a predominately white jersey trimmed in dark green and gold, emblazoned with the Texas Stars primary logo on the front crest. The shoulders are dark green and have small patches featuring the Stars’ secondary logo. During the 2011-12 and 2012-13 seasons the team wore the alternate jersey with the original home socks, which were half white, half dark green, bisected by a thick gold band. The 2013-14 home uniforms will feature a newly designed sock of all white with bands of dark green and gold. The new jerseys were designed by the Texas Stars in conjunction with Reebok, the official and exclusive jersey supplier to the American Hockey League. 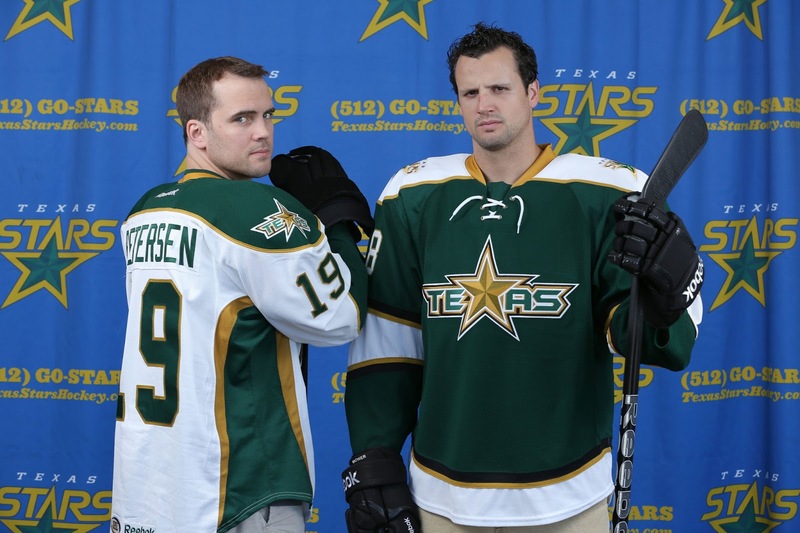 The jerseys will be available in both replica and authentic versions at the Texas Stars merchandise stands beginning this Fall.